6.8 SPC caliber ammunition has been popularized as a “do it all” round. 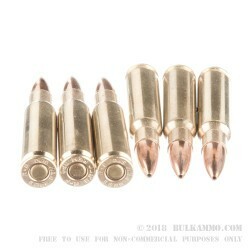 Its intermediate cartridge size affords the shooter a great degree of control over the recoil of their firearm, while the meaty bullet weight and dimensions provide plenty of terminal energy on impact. For this reason, 6.8 SPC is used by hunters and recreational shooters alike. Corbon Performance’s Match Grade 115-grain HPBT caters particularly to precision shooters on the market looking for laser precision. 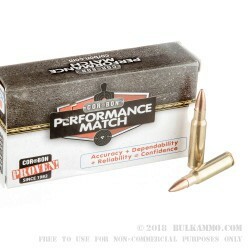 Although the hollow point of this round would cause it to expand on impact, Corbon designed these match-grade bullets with the sole intent of extreme accuracy. Hollow-point boat-tail was chosen because its method of manufacturing creates the most uniform and aerodynamic bullet, two important details when you’re trying to score that last bull’s-eye and bring home the gold. 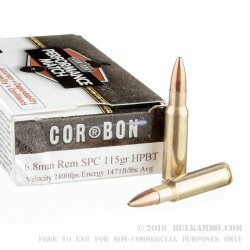 The Corbon Performance 6.8 SPC ammo travels at 2,600 feet per second out of the barrel and produces 1,750 foot-pounds of muzzle energy. 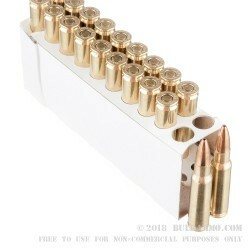 The bullets loaded are 115-grain hollow-point boat-tail rounds. The boxer-primed brass casings are safe to reload.